Are you looking to transform your home’s dining experience? Do you want furniture you can trust to deliver years of outstanding and reliable service without breaking down? Are you searching for furniture that is right for your existing décor or your vision for your home? 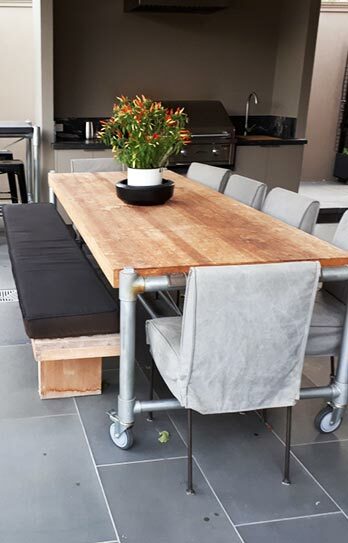 With over 30 years of experience designing and crafting immaculate and functional concrete and timber furniture for customers living throughout Melbourne’s metro area the team at Snap Concrete are here to turn your furniture dreams into a reality! Hand-crafted to suit the customer’s personality and style each piece of our furniture is made using only the highest-quality materials, guaranteeing that the end product you receive is uniquely your own. With our unique American Oak dining tables Melbourne residents will be able to comfortably host gatherings, dinners, and events from their living room with ease. 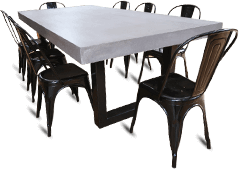 Like our name suggests Snap Concrete specialise in designing and building outstanding pieces of concrete furniture for homes across the city. In addition to our expertise with concrete our designers and fabricators can also skilfully incorporate the best species of local and international timber into our bespoke and modern pieces of furniture. Renowned for its unique texture and patterning American Oak suits dining tables made for Melbourne residents. Hardy and rich in tone, an American Oak dining table hand-crafted by Snap Concrete will deliver decades of faithful service and soon become an integral member of the household. Committed to turning our customer’s dreams into a reality the furniture fabrication professionals at Snap Concrete use only the best materials and products to deliver products of the highest-quality. 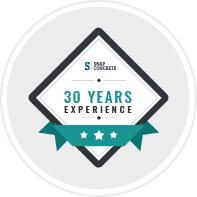 With over 30 years of hands-on experience and knowledge you can trust the innovative and inventive team at Snap Concrete to craft the furniture that has been missing from your life. With our American White Oak dining tables Melbourne locals and beyond can show off their home with a piece of furniture that will immediately turn heads. Boasting a subtler colouring than the bold solid American Oak, American White Oak transforms dining tables into something more. Haunting and evocative our American White Oak dining tables help homeowners immediately make a statement to guests. Dominating the dining area our custom-made dining tables demand respect and attention, while also inviting any guest to sit down and enjoy a delicious meal. Not just limited to crafting ostentatious American White Oak dining tables the team at Snap Concrete can build the American White Oak tables Melbourne customers need to tie their living space together. 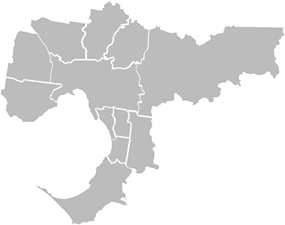 As one of the leading suppliers and builders of American oak furniture Melbourne homeowners wanting higher-quality furniture in their homes can trust Snap Concrete. Thanks to our design mastery and innovative fabrication of solid American Oak dining tables our customers can add unique character and style to their homes for less. Change the entire atmosphere of your home by getting in touch with the team at Snap Concrete. Consulting directly with our valued customers our creative experts can design and build durable and beautiful solid American Oak furniture Melbourne-based residents have been waiting for. To take advantage of our cost-effective and natural solid American Oak tables Melbourne residents can get in touch with us today on 0450 535 075.